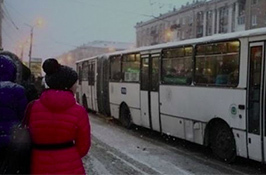 Omsk residents can get the necessary information about the movement of public transport in the city, turning to the passenger information system (ASIP), which forms the schedule of transport and predicts its arrival at any stop, told the Omsk city hall. System is available not only via the Internet, but also on the phone 90-12-12, noted in the Omsk city hall. The informant answers the calls of passengers. After dialing the number, choosing either the type of transport is needed – bus, trolley or tram, or a stop of interest to the passenger. The informant, depending on the request, will tell where the desired transport is going, or when it will arrive at the requested stop. In addition, the informant will notify if the transport is not on the route, for example, goes to the Park, simultaneously picking up passengers. The Department of transport mentioned that the website for informing passengers was developed to monitor the work of municipal transport and transport of private carriers.